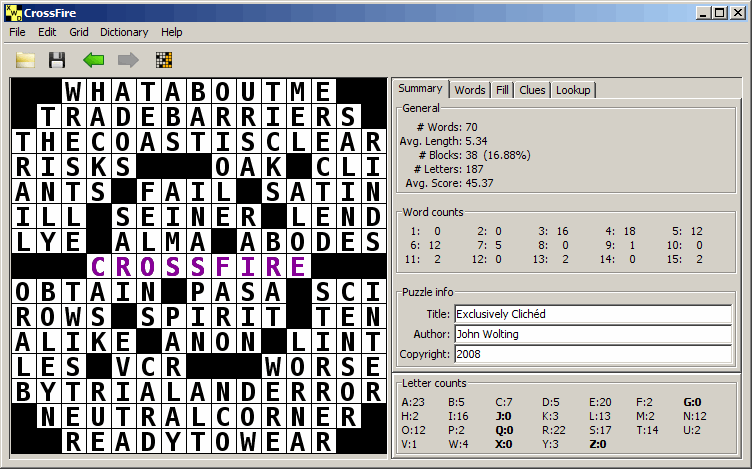 CrossFire is an innovative tool for creating professional quality crossword puzzles. It has been designed from the ground up to provide all the power you need, without any added complexity to get between you and your creative muse. Whether you are a crossword pro looking for a new tool to simplify your workflow, or a new convert who is ready to learn just how simple and exciting it can be to create new puzzles, CrossFire will give you the tools that you need to take your puzzles from concept to completion. Best of all, you won't have to shop for a new machine or install Parallels: CrossFire gives you the same puzzle-building power no matter what your computing platform. Automatic "quick grid fill" provides information on where and why unfillable grids fail. Selective fill (quick or interactive) of puzzle sub-regions. Easy editing and manipulation of multiple custom word dictionaries. Constantly updated statistics on letter counts, word lengths, and illegal/unfillable grid configurations. Integration with the Matt Ginsberg clue database. Whether you are a novice cruciverbalist or a pro; a computer wizard or a neo; a technophile or -phobe — CrossFire aims to make your life simple. All your work is focused in a single location, without annoying special modes or multiple windows. Multiple tabs ("Summary", "Word", "Fill", "Clues", and "Lookup") help you focus on the task at hand, but let you easily jump from one task to another without losing any work. Whether you are designing the crossword grid, finding the perfect set of fill words or cluing your puzzle, the information you need is always in front of you, and extraneous information is kept to a minimum. CrossFire always strives to help you out without getting in your way. From the start, CrossFire was written with the specific goal of providing first-class support for all major OSes. It has been tested extensively on Windows, Macintosh (OS X 10.7.3 & later), and Linux, and is ready to run no matter what your favorite system. 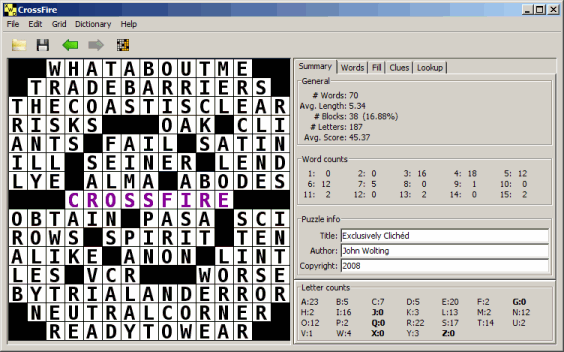 CrossFire gives you the power to write professional quality puzzles for any market. Yet at just $50 for a registered copy (via our e-commerce provider), a single sale in any major publication will pay for the software outright. You also know that your software will always be current, because your purchase guarantees you a lifetime of free updates. The download page provides access to the full current version of CrossFire. If you've bought a registration code, this will give you access to all of the latest features. (Once you've bought CrossFire, you've bought it for life. There will be no charges for any future upgrades.) If you don't have a registration code, it'll still run for you, but not at full strength: your sessions will be terminated after 1 hour and you won't be able to save your work. You will, however, have plenty of time to try CrossFire for yourself and make sure that it suits your needs. Our goal is to have no unsatisfied customers — this means we plan to provide great support, but it also means that if you rely upon a feature that we cannot provide yet, we want you to know about it up front. Now that we've convinced you to give CrossFire a try, and you've got it installed on your machine, what's next? We've got documents in a variety of styles to allow you to hit the ground running and start making top quality crosswords as soon as possible. No matter how you like to absorb information, hopefully we've got at least one doc which matches your style. Of course, we recommend that you eventually read them all for best results. The reference manual: absolutely all the features of CrossFire, presented menu-by-menu and tab-by-tab. If you want to know everything, this is your best source. FAQ: The most frequently asked questions about CrossFire and how best to use it. Years in the making, and worth the wait. Puzzle construction walkthrough: A step-by-step demonstration of the puzzle creation process, covering theme selection, grid creation, filling, cluing, and more.